Last week I decided to do an experiment. I have been getting complaints from people who use my FPTraffic tool that it’s impossible to build up large Facebook Pages for cheap anymore because the market is getting saturated (more and more people are trying to do it). Well, I think Facebook is too large to truly become saturated so I decided to create a brand new Page and made it my goal to reach 10,000 Likes in 1 week for $100. I will be doing a complete case study post with more information on that particular Page soon, but here are my 3 steps to researching and creating a successful Facebook Page. I have used this same method to not only build up a Page to 10,000+ Likes within a week, but to also create several large Pages with hundreds of thousands of Likes. The first thing you need to do is pick the right niche. Facebook is accessed by 669,000,000 users a day. Those people have a huge variety of interests. The key factor to building a successful Facebook Page is the niche. If you want to get cheap Likes that are worth your time and money pick a niche that has not been saturated by other people’s Pages and focus on that. For example, if you try to build a Justin Bieber Page than you are probably wasting your time. I’m not going to disclose my niche yet, but it was something I’d been thinking about for awhile and when I searched I found that there really weren’t any large Pages for it. This made me think that it could be potentially be a good niche to create a Page for, but before I created it I first wanted to double check that there was actually some interest in it on Facebook. It’s great to have a Page in a niche were you have little or no competition, but is there really any interest in that niche on Facebook? More than likely, yes. But, how much? If your niche does not appear to be saturated and there seems to be a large enough potential reach to make building the Page, finding content, and advertising it worthwhile then I recommend you create an ad for your Page to start generating targeted Likes. Of course, prior to this you will need to actually create the Facebook Page, find and post some content, and potentially have more content scheduled out while you run your ad (shameless plug: FPTraffic Post Scheduler makes it easy!). If you have all that done then you are ready to create your ad. Facebook has a cool feature that lets you actually create your Facebook Ad to get more Likes on your Facebook Page. When setting up your ad, select that option, find a good picture that emphasizes your niche and will capture the user’s attention, write a catchy headline, and use ad copy to entice the user to click “Like“. It’s really not that difficult. Make sure you choose your niche as the Precise Interests (shown in “The Niche” section above) and choose Optimized CPM for your bidding model. Optimized CPM is by far the best bidding model for Facebook Pages. Set a low daily budget to start (I usually do $3-5) and once approved you should start seeing new Likes on your Page! Make sure you keep posting good content to help get viral traffic (free Likes). With my campaign from my Page with the 10,000 Likes over half of them were viral! Once you have your Faceook Page created, your content posted, and your Likes (users) coming in, it’s time to monetize your Page. I will be writing more about that soon, but for now, get to work building up your Page! Build it, grow it, monetize it. Let’s make some money! My Facebook pages doesn’t work so I will try this one – eagerly awaiting the monetizing” bit. Have some issues follow you here though. I didn’t find a “Create Ad Page” link, so I selected “Create Ads”. So, I need to go through the ad-creation-process before I can start testing the Niche and Audience – right? You need to create a Page first probably. Hope you can explain about how to find precise interest for our niche. My niche is iPhone & Android games. I’m an indie game developer from Indonesia. Feels like it’s really hard to get precise interest for my niche. Tried iPhone games, Android games, and so on. Maybe you can explain more about the audiences too. Is it better to target broad audience or specific audience? What type of games are you developing? I’d try to go more specific. Great tips!! Thank you so much for the information, I will start today doing it! I’ve been building up a page for the past month now, I’m just under 50k likes. One thing I’ve found is that the number of organic likes are very closely tied to the number of paid likes. So when I reduce my ad spend my number of new organic likes goes down dramatically. This is all according to the page insights tool. Have you experienced the same thing? Hello would you show me some clues, we can talk on Skype is that Ok with you? You can email me and we can discuss it. Will you explain a little bit finding low compition niche on facebook? I got the idea from your post but maybe a little bit explanation more.? 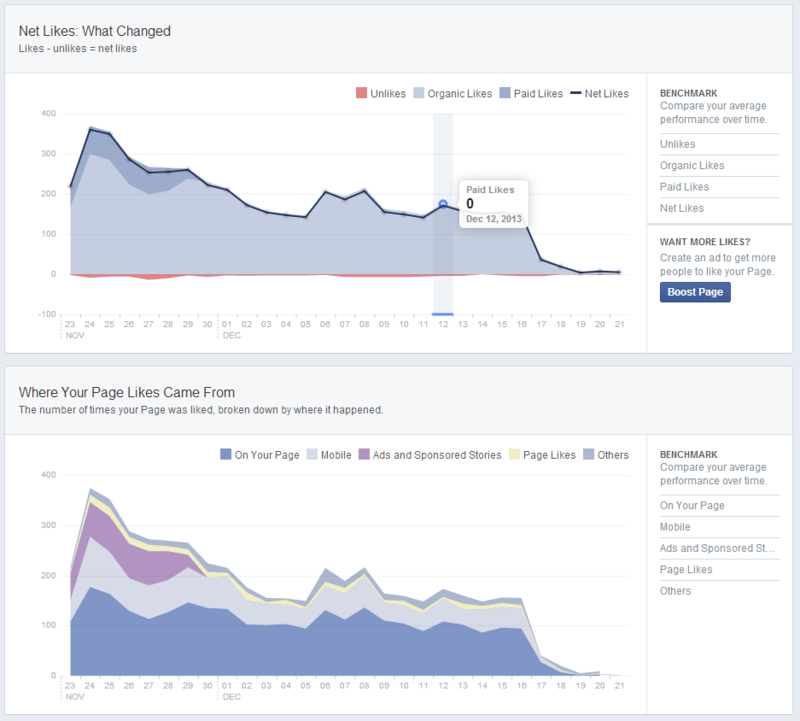 What metrics will make a niche hot and low competitive on facebook in your view.? I look for something that does not specifically have any large (maybe 25k+?) fan bases. If there’s a single Page that is big and a bunch of other small Pages that might be a sign of a good niche too. Choose something you are interested in. Luke, have you monetized your page yet? I can’t wait for those likes to turn into some $$$. So please add some offers so we can see all your efforts were worthwhile 🙂 that should give the rest of us something to work towards. I rarely decide to use Facebook ads. I was always trying to make everything without spending money. But that doesn’t mean that Facebook ads are not good. If anyone decide to buy some traffic I would recommend Facebook ads or StrumbleUpon ads. Those are very effective. I have never before created any facebook fanpage or that you can run a campaign even with few bucks. I have no idea how to monetize it so I can’t wait for the part two as well ! Hi Luke, Sorry for an offtopic comment but i just wanted to tell you that uour blog showing your own adsense ads. haha, thanks for letting me know. Still waiting for the Case study. I’ve spent >$50 to get roughly 280 likes. How do you target the precise interest for the weight loss niche? I know that it’s very competitive. Great post Luke. That’s how it’s done. But also before launching have a monetization plan in place. Facebook pages can be absolutely fantastic for driving traffic to a website that’s monetized or set up to attract email subscribers. When a FB post does particularly well (i.e. makes some good money or attracts a high rate of subscribers), blast that post into the stratosphere by promoting it with FB ads. Each day or so I plan out a blog post and corresponding FB post that will profit from not only my fanbase, but also perform well enough to profit with promoting it. Any post that profits from ads can make a lot of money fast because it’s so simple to drive a truckload of targeted traffic to it. Hey Luke, very good information? When will you post the case study for this Page? We can’t wait to see details about growing the fan page, monetize it etc! I noticed you have many days to make a new post. Maybe you are busy. Hi Luke, I am running FB ads too, but the cost is so high and my page got only 100 Likes after spending like $50 of ads. Do you have any suggestions on how to decrease the budget and keeps everything goes up? Do you solely use Like for your ads? There are many reasons why you might be paying too much, but more than likely it’s your niche. Also, I’m assuming you’re using Optimized CPM? I test all kinds of Facebook Ads. Hey Luke, I’m curious as to why you’re using Right Column ads instead of News Feed? Is it just cheaper to advertise on the RC nowadays? I’ve found that w/ my clients I’ve gotten much higher CTRs w/ NF ads. Just curious as wo why and if I should switch back to RC? Hey Luke what do you think of buying likes from fiverr? Are the quality of the likes just too bad for it to be worth it? It would probably be a waste of time and money because more than likely they’d all be untargeted or bots. Hey Luke, great article. It’s really helped me a ton. I tried my luck at building a page and has managed over $400 commissions this month, mainly Amazon, after a minimal investment in likes. I quickly turned the paid likes off as the organics were pouring in. I had been averaging 150 likes a day, but just a few days ago they dropped nearly to nothing as if someone had flipped a switch. Check out the stat screenshot: http://i.imgur.com/nIxj1mS.png – Pretty crazy, huh! I haven’t changed my posting habits one bit. In fact, my post to night amassed 140+ likes, 15 shares and 20+ comments in two hours, so interaction certainly exists. Have you ever experienced an unexplained drop off like this? It’s a bit alarming! This has being useful. I’ll be creating my fanpage targeting Ghana soon. Hey Luke, I run a page that has about 100,000 likes. This is related to the comment by Brandon Smith about having a drastic hit on new likes and engagement. Through Oct and Nov we were picking up to 1k likes a day. Dec. it appears that Facebook changed their algo in Dec. We also see that posts with a link to outside website seems to cut the reach of the posts. Have you seen the same things? When my content gets engagement I see similar results as to what I used to, but it’s true that less engaging content pretty much dies right away. I’ve also never really seen a TON of engagement or reach on links, but with the larger image preview on links I am seeing pretty high CTRs. I have a question on how you create your fanpages. Do you create the fan page off your personal Facebook page, or do you create an alias Facebook profile page to attach all these fan pages to, or do you create a new profile using the actual characters name and then create a fan page off that. It doesn’t appear that you can create a fan page without having it attached to a personal profile any longer unless I’m not doing it correctly as its been awhile since I set one up. Can you please clarify as I want to start building a page using your techniques. All of my Pages are created under my personal Facebook account. If I create the Pages under my personal Facebook account, will the pages be mentioned on my actual personal page for others to see. I basically want to keep these pages separate from my personal account (meaning I don’t really want them mentioned or visible to others when they visit my personal page. Or does creating them under my personal account just give me admin access when visiting my personal account but the page isnt mentioned anywhere in my personal account. Sorry if this is confusing. Thank you for an awesome post, Luke. The biggest problem I’m facing with my FB pages is that exposure rates have declined greatly over the past year or so, probably because Facebook want to FORCE page owners to promote their posts using money. Therefore, the question is: What’s the point of getting fans (even if a like is only US$ 0.03) when the majority of them are not even going to see your posts, unless you spend money on promoting them ? Yes, Facebook is intentionally decreasing reach, but there’s still a ton of opportunity. Earlier this week I calculated my average % reach per post on 2 of my Pages with about 725,000 Likes total. On one Page I’m reaching about 26% of my users and on the other 50%+! If your posts are engaging then your fans will end up seeing them. Maybe not all of them, but a big enough portion to make it worth it IMO. Hey Luke, I’m set up to optimize for likes to my page, but it’s an effective cpm of like $17.80 (just started today and only have 2 likes so far). Granted, it’s an 8% response, but still, that’s $0.22 per like. That’s what, maybe 400 likes for $100. Does that drop after it starts rolling? Never mind. I found your article on optimization. My cost has plummeted. I went from .22 per like to .03 by the next day. When narrowing down our potential reach for a niche, what’s too much and what’s too little? Right now, the potential reach for my ad is 580,000 people with daily reach between 5,600 – 15,000 people. Is that too broad a reach? Also, does a broader reach drive up ad prices? Does the graphic artist you hire, create your art in teespring or can they create the art outside of teespring & you import it? If inside, how do you get that art from the artist for your teespring account so you can post? Hope this makes sence. They make it outside of Teespring and just email it to me. Thanks luke, this post has answered a lot of my questions. I just recently built my first fan page but wasn’t sure what would be the most cost effective way to advertise for likes. I’ll definitely try ocpm. Hi luke am very new to this and a lot of info your sharing is over my head, do you have a newbe class? Thank you. HELP!!!!! !